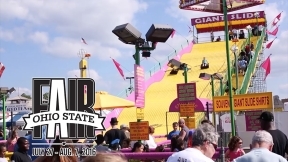 From the very first Fair held in Cincinnati in 1850, which lasted only three days, to the 12-day exposition of today, the Ohio State Fair has celebrated Ohio's products, its people and their accomplishments. The first Ohio State Fair was planned for September 1849, but an outbreak of Asiatic cholera forced cancellation of those plans. The following year, later dates were set to lessen the risk of cholera. Even so, Darius Lapham, the superintendent of the grounds, died of the disease just a few weeks before the opening date. Camp Washington (two miles east of downtown Cincinnati) was the site of the first Ohio State Fair, Oct. 2 - 4,1850. In 1886, the Fair moved to its current home at what is now called the Ohio Expo Center.